Jessie Lo in performance of Tangled, Boston University College of Fine Arts. Photo courtesly of Glen Engman Photography. ✣ BUTI Faculty recital. Program TBA. West St. Theatre. 7PM performance. ✣ Premiere performance of Remembering the Many for wind ensemble – written in reflection on the atrocities of mass gun violence in the American schools. Commissioned by World Projects, Inc. for performance by the Lincoln High Wind Ensemble of Stockton, CA. 8PM performance. ✣ Official premiere performance of Thinking in Four Places for saxophone quartet and digital percussion. Commissioned and performed by the Pharos Quartet. Preview and subsequent performances at Boston University (1/21), Marshall University (3/7), Muhlenberg College (4/17). ✣ Premiere performance of A picture of Big Rock Park - written for and premiered by my oldest daughter (8)! We will premiere the piece for violin and piano at the Rivers school Conservatory’s annual Seminar of Contemporary Music for the Young. ✣ Premiere performance of stand, March, RISE!! for orchestra as a commissioned portion of the Chicago International Music Festival hosted by World Projects. Tickets available via Chicago Symphony Center Box Office. ✣ Performance of Sitting in the House of a Giant by the Boston University Tanglewood Institute Wind Ensemble under direction of David Martins. ✣ Faculty recital at BUTI, featuring a variety of chamber works - more details soon! ✣ The premiere performance of Sitting in the House of a Giant: in memoriam G.S. for wind ensemble. This performance will be given by the Whitney M. Young Magnet High School Wind Ensemble, conducted by James Barbick, as part of the New York Wind Band Festival. ✣ Incidental music for a production of the Tempest by the Watertown Children’s Theatre. A host of New Orleans inspired pieces throughout the show. ✣ Performance of 4X4 for percussion quartet, as part of the Boston University Tanglewood Institute’s 2015 Percussion Ensemble recital, under the direction of Sam Solomon. West Street Theatre: 44 West Street - Lenox, MA. ✣ Premiere performance 4X4 for percussion quartet, as part of the Boston Composers' Coalition collaboration with the Boston University Percussion Ensemble, under the direction of Sam Solomon. ✣ Premiere performance of Not but a seed… for SATB choir. This piece, with text by the composer, was commissioned via World Projects, Inc. and the Boston Composers’ Coalition, premiered at the New York Choral Festival by the E. Stuudio Youth Choir from Estonia. the Boston Composers' Coalition and World Projects, Inc.
Andrew Stetson performs …and so then I threw the stone. as part of the ITG New Works recital. Click for details. Boston Composers' Coalition collaboration with the Arneis String Quartet. Belly Wine Bar, Cambridge MA. The Boston Composers' Coalition presents the Arneis String Quartet. Tsai Center, Boston University, 8pm. Two performance of One Hen for wind quintet and narrator. Concert Fund. Boston Children's Museum. Presentation on the Longy School of Music's Composers Forum. Longy School of Music. 2pm. Presentation on MIT's Composers Forum. Lewis Music Library, MIT. 5pm. The Boston Composers' Coalition presents the Anthology vocal quartet. Killian Hall, Massachusetts Institute of Technology, 8pm. One Hen for wind quintet and narrator. 2:30pm, Ozawa Hall. Click here for tickets and program information. Five Action Verbs for solo tuba, featuring Jobey Wilson. Premier of Five Action Verbs for solo tuba, featuring Jobey Wilson. performed by the wind quintet Vento Chiaro. commissioned and performed by the wind quintet Vento Chiaro. 333 Winter St., Weston, MA. Contemplation No. 1 for Cello and Piano. 855 Commonwealth, Ave. Boston, MA. the Boston Composers' Coalition presents the Redline Quintet. 1pm; The First Parish in Malden. 2 Elm St. Malden, MA. 8pm; Killian Hall, Massachusetts Institute of Technology. 160 Memorial Drive, Cambridge, MA. The Rivers Symphony Orchestra; David Tierney, director. BUTI percussion ensemble; Sam Solomon, director. 7pm; BUTI West Street Theatre; Lenox, MA. Vento Chiaro, BUTI faculty recital series. 7pm; Trinity Episcopal Church; Lenox, MA. Tangled, for solo piano and live signal processing. 1pm; The Fenway Center, Northeastern University. the Boston Composers' Coalition presents Vento Chiaro. 7pm; Killian Hall, Massachusetts Institute of Technology. 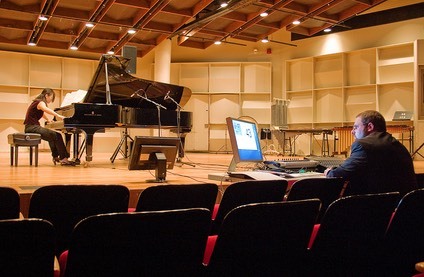 composer residency/guest lecturer at Keene State College. Pas de Trois, performed by the Fourth Wall. Performed by the Lorelei Ensemble. the Boston Composers' Coalition presents the Fourth Wall. Presentation of Americana No. 2. Five Views from an Island, for viola and piano. The Two Composers: Ketty Nez, piano and Mark Berger, viola. 20 Downing St., Worcester, MA, 7:30. Middlesex Community College, 591 Springs Rd, Bedford, MA.